Or rather was for sewing. 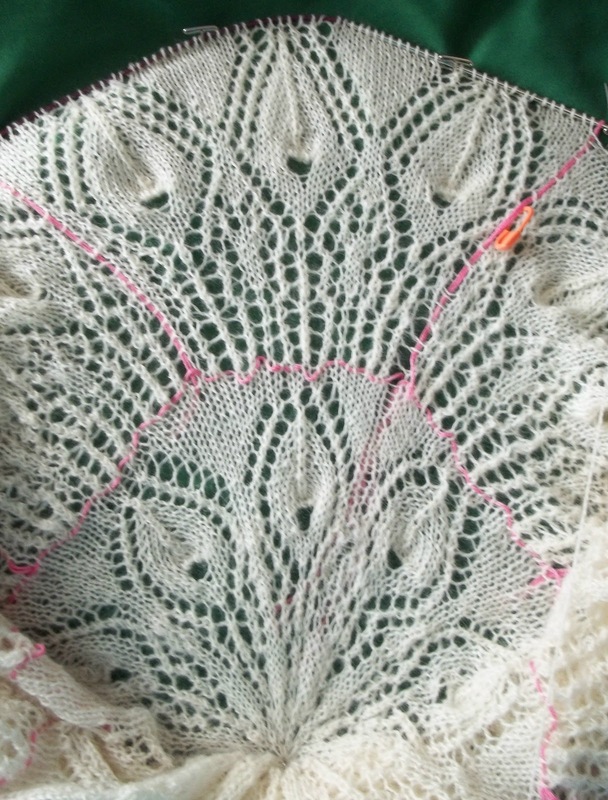 It's a lovely handkerchief weight linen—and so worth the effort of remaking. And looks good in spite of the less than perfect waist band. I have another skirt just like this one—in a bleached white linen. Then, on a roll, and with black thread already threaded in the machine, I disassembled a shirt dress—This too, is now 6 inches narrower, and almost the same shorter. The sleeves got removed and reshaped, too— making the shoulder a bit narrower, too. But the collar and neckline are intact. Later I can add to the existing back darts, and incorporate some front darts, and make this dress another size smaller with not too much effort. The dress is a heavy weight linen and after decades of wearing has reached that wonderful soft state—it gets machine washed and dried, and ends up not smooth and crisp, but not a mass of wrinkles, either—perfectly wearable, casual softness. I added new buttons to it a few years ago, to dress it up and change the look—and now its been changed again. So now I have a few pieces of clothing that fit better—coming up next up are 2 more linen shirt dresses—sleeveless ones. But first a linen/rayon blend skirt, in white, with pretty (machine) embroidery on the patch pockets. It's been disassembled already--there are a few more linen skirts after the embroidered pocket one, (like the white one mentioned above) to also redo. The zipper will stay intact in the embroidery pocket skirt--this one I am taking in at the sides. I had to remove (and will replace the pockets) and the waist band, but the zipper will remain untouched. Maybe, while I am at it, a linen jacket, will be reworked, too. If not completely redone, at least partially reshaped. Likely the collar and neckline remaining unchanged—I'll just remove the sleeves, cut down both the side and shoulder/armhole, as well as the sleeves. I have both natural linen ones, and bleached/white linen jackets—and currently no light weight summer jackets that fit. Most of my other jackets are nice, but not worth altering to fit the trimmer me. It just makes sense to work on the nicest of my over--sized clothes—and not the cheapest. 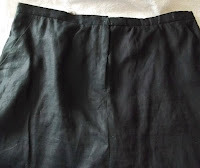 Some of the cheapest skirts will just have some elastic sew in—not even inside the waist band—just on the inside edge to let me get a few more months of additional wear out of them. Pretty fancy duds for not doing much of anything special. I really need to keep up sewing—and get the fabric I have cut and sewn. I don't look thin(ner) and better wearing baggy shapeless clothes—and I garnered a few compliments today—several people finally noticed that I was thinner is my better fitting dress. I am still stuck at the same weight—but I have been exercising more, and I am trimmer and fitter looking-more muscle, less fat, and better looking. I got another inch of the socks done, too, and the last 2 rounds of chart 2 (pattern round and plain round) on the shawl—well those 2 rounds got done this AM. One more inch of the sock before I can start the toe—so its not quite done yet—but closer! 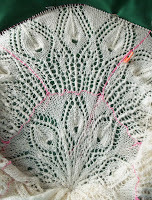 The next round on the shawl will take a bit of time, too. It's time to add a new life line and some more stitch markers. Chart 3 is smaller (printed in a smaller grid) and will be a bit harder to read. But I need to get back to work on it.